The Omega 8008 Juicer & Nutrition Center has been equipped with some upgrades that undoubtedly make this masticating juicer more proficient than the earlier models. It is versatile and effective at handling a variety of functions, such as juicing, grinding, chopping, mincing, and pureeing. Like previous models, it functions at 150 Watts, with 120V. The first thing that differentiates this 5th Generation Nutrition Center is the 2 HP motor. This puts it on the same level as commercial juicers. It juices wheatgrass, leafy greens, and carrots without producing any heat. It houses the GE Ultem auger, eight times stronger than others on the market, and rotates at about 80 RPM. With its predecessor, (Omega J8006) the first stage juicing screen is plastic. In the 8008, it was upgraded to a more durable stainless steel with 25 percent more area allowing for a higher yield of juice to squeeze through. This model also only weighs 13 pounds and takes up less space on your counter. The handle has been redesigned in what seems as though you are slipping your hand under a “hood” and lifting up. The components that touch the produce are entirely BPA free. This juice extractor takes seconds to set up. Before using, cut your produce into thinner items in order to fit them down the feed chute, which only measures 1.5 inches across. The food tray has been expanded and is deeper than previous models. The plunger is useful when trying to push items down into the barrel. It is important to use slight pressure when juicing. Another helpful hint is to alternate between hard items and soft items. Some soft fruits may get hung up in the barrel. It comes with a reverse button. If anything gets clogged, push it a couple of times to move the food in the opposite direction. Feel free to put your pulp back through the electric juicer to extract the highest amount of juice possible. Prior to drinking, use the sieve to remove more pulp from your juice. It is better to wait until you finish juicing to use the sieve instead of while you are juicing your vegetables or fruits. As soon as you finish juicing, clean your Omega J8008C juicer. Disassemble the machine, submerge in hot, soapy water, and wash everything. Since the juicing screen has more screen area, it will take a little longer to clean. Use the provided cleaning brush to remove the pulp that gets stuck in the little screen holes. The flat side of the brush is useful in scraping away the excess pulp. It probably takes about five minutes or so to clean all of the parts. While you can wash the parts in the top rack of your dishwasher, hand washing is recommended. At the very least, rinse everything and scrub the screen prior to placing into the dishwasher. This method prevents any hardening or buildup. If you want a juice maker that is going to safely extract high amounts of juice and preserve the nutrients, enzymes, and vitamins, well, this is it. This juicing machine utilizes a “dual stage” mastication method. It effectively crushes items with the slowly rotating auger and then pressed against the juicing screen to completely extract the juice. This process contributes to low levels of oxidation and heat increasing the shelf life of your juice to 72 hours. Additionally, this horizontal single-gear masticating juicer is BPA free. Not only it can help you prepare healthy juices but it also serves additional functions to provide variety in your juicing routine—food processor, homogenizer, pasta maker, coffee grinder. The complimentary nozzles can be used to make pasta of varying shapes and sizes, you can choose between a round or a flat noodle; better yet you can add some flavor to your pasta to make a Korean style u-dong noodles. Nozzles a with larger opening can be used to form breadsticks. The bad news is you still have to prepare your dough. What Kinds of Produce Can Omega 8008 Juice? Hard produce include sweet potato, turmeric, ginger, apple, cauliflower, pepper, fennel, carrots, pumpkin, asparagus, broccoli, bitter gourd, pineapple, watermelon, garlic, beets, celery, yakon, pear, coconut, cucumber, and cilantro. Leafy greens include kale, cabbage, romaine lettuce, parsley, dandelion greens, spinach, lettuce, beet greens, peppermint, wheatgrass, brussels sprout, moringa, pine tree needles, basil, collard greens, and spring onion. Soft produce such as avocado, grapes, blackberry, tomato, papaya, pomegranate, kiwifruit, cranberries, peach, strawberry, melon, and mango can be turned into a puree using the blank screen. The Omega 8008 Nutrition Center is utilized for many functions, rotating at low speeds to guarantee taste and nutrients are not lost in the juicing process. 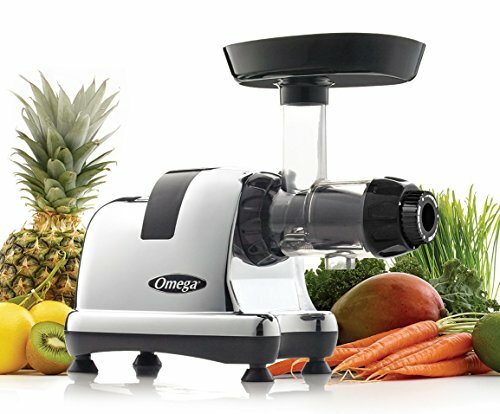 Almost exactly the same as the Omega 8007 juicer, this machine comes in chrome and black, carrying a higher price tag than the other model. The sturdy, commercial grade cold press juicer is excellent at slowly juicing leafy greens, wheat or barley grass, and hard vegetables. If you would like to juice fruit, ensure that you alternate between hard and soft produce. This will prevent any buildup in the barrel. This machine is highly versatile and is capable of making baby food, nut butter, and even pasta. Customers enjoy this model immensely because of the juice extractor’s ability to produce high amounts of juice, the highest nutritional value, and tastes that make your taste buds dance. The 15-year warranty is highly attractive because if anything breaks under normal use, then it is covered. Juicing newbies and connoisseurs can appreciate that this machine will last them a very long time.